These Maple Hazelnut Cookies are so easy to make! 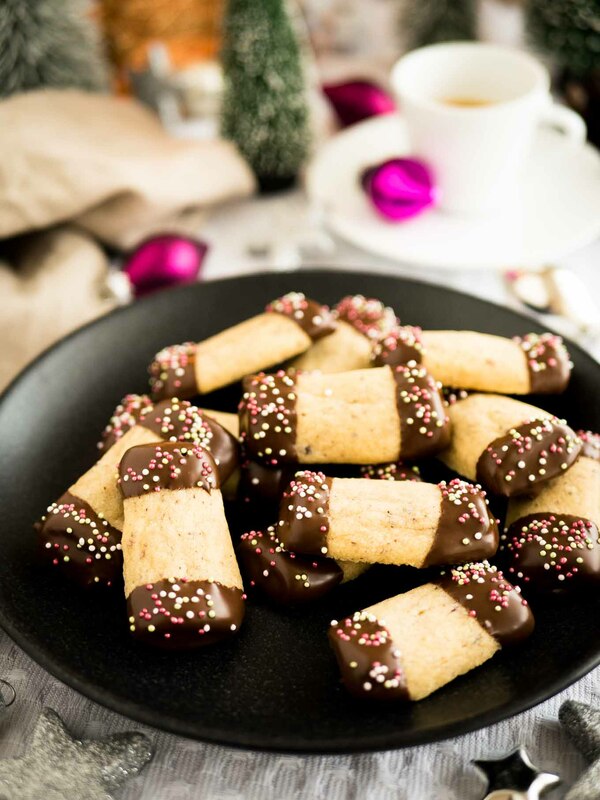 Ground hazelnuts and maple syrup make these cute log cookies extra flavorful. Christmas is almost here! Are you guys excited? I’m definitely excited! Today I’m sharing another cookie from my cookie tray. After my easy Nutella Cookies, my flavorful Orange Almond Cookies and my Gingerbread Christmas Brownies, it’s time for Maple Hazelnut cookies! These Maple Hazelnut Cookies are so cute, aren’t they?! 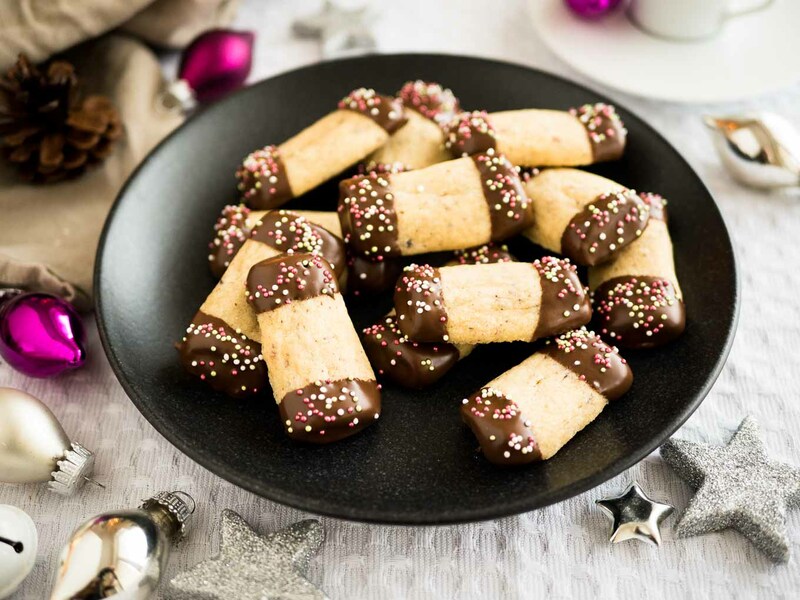 The ends are dipped in dark chocolate and topped with festive sprinkles. 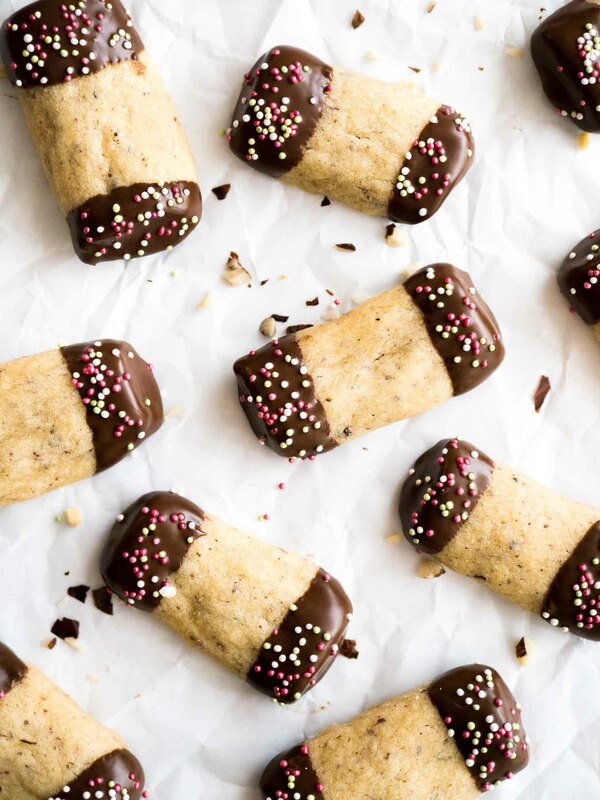 They are formed like little logs and make a pretty addition to every cookie tray! I really love maple flavor! 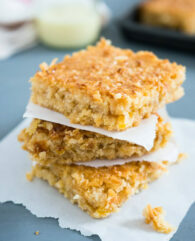 I often use it to caramelize nuts for topping muffins or sweet bread like my Banana Bread with Maple Walnut Topping. Maple and nuts are a great flavor combination and make everything more delicious in my opinion. 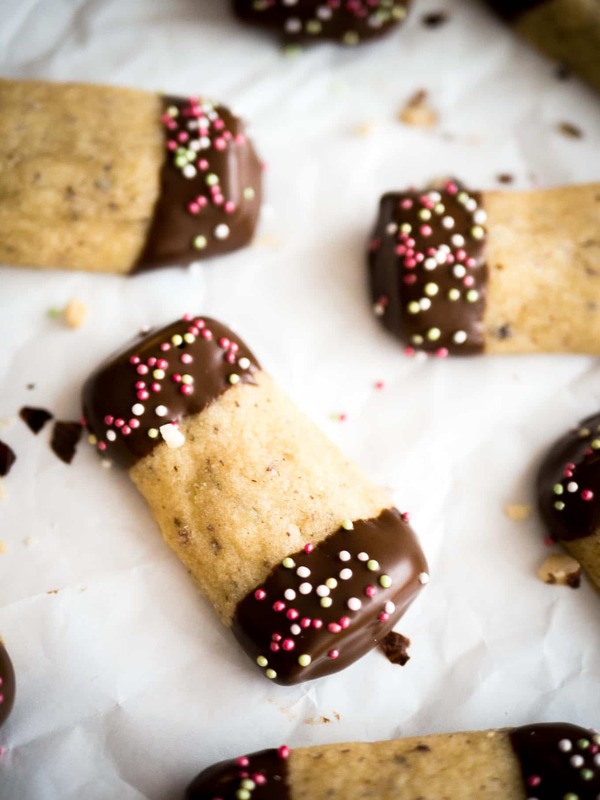 For this cookie recipe, I use maple syrup and ground hazelnuts together. The maple syrup gives flavor and sweetness and the hazelnuts add texture. This cookie tastes like a mix of a butter cookie and a shortbread cookie. The dough is quite soft so it should be chilled overnight otherwise it will spread in the oven and you won’t have little logs. Normally I wouldn’t use so much maple syrup in cookies but because these aren’t cut out cookies it’s perfectly fine! These maple hazelnut cookies are made like slice-and-bake cookies. After chilling overnight in the refrigerator the dough is quite firm and easy to handle. Divide it into eight pieces and roll each into a long thin log. Don’t let the dough get too warm! If your kitchen is quite hot I would recommend chilling the logs after rolling them. My first batch this year got quite warm and the dough did spread more in the oven. Not big of a deal but the second batch was a bit prettier! The logs are then cut into 2-inch long little logs and baked for a few minutes until slightly brown on the edges but not too long. You want a slightly soft cookie and not a crispy cookie! 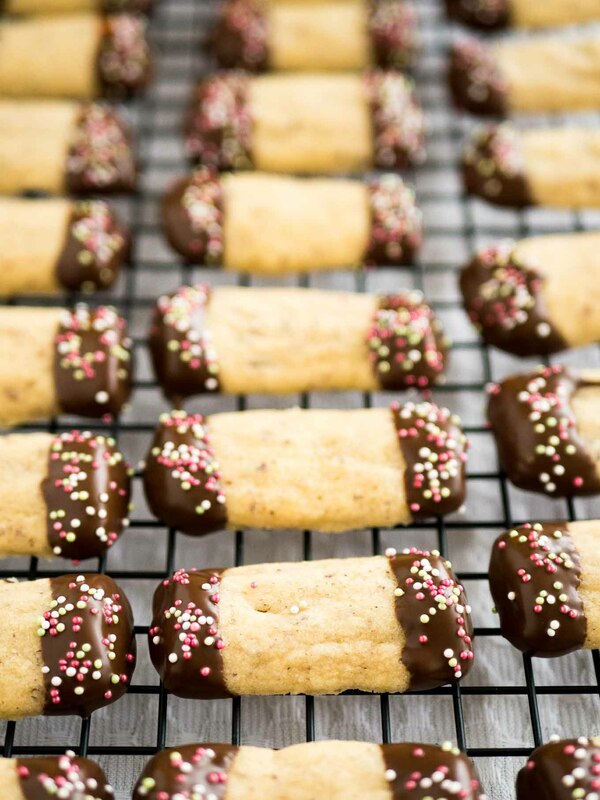 Let them cool down completely and dip each end in dark chocolate. And then comes my favorite part: the sprinkles! I used my favorite green, pink, and white sprinkles because they are so festive and colorful. Perfect for Christmas! 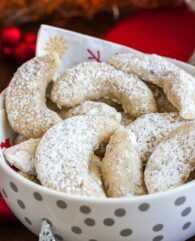 In the bowl of a stand mixer fitted with the paddle attachment combine flour, baking powder, confectioners' sugar, ground hazelnuts, cinnamon, and salt. Add maple syrup and cubed cold butter. Mix on medium speed for about 1-2 minutes until you have a smooth dough. 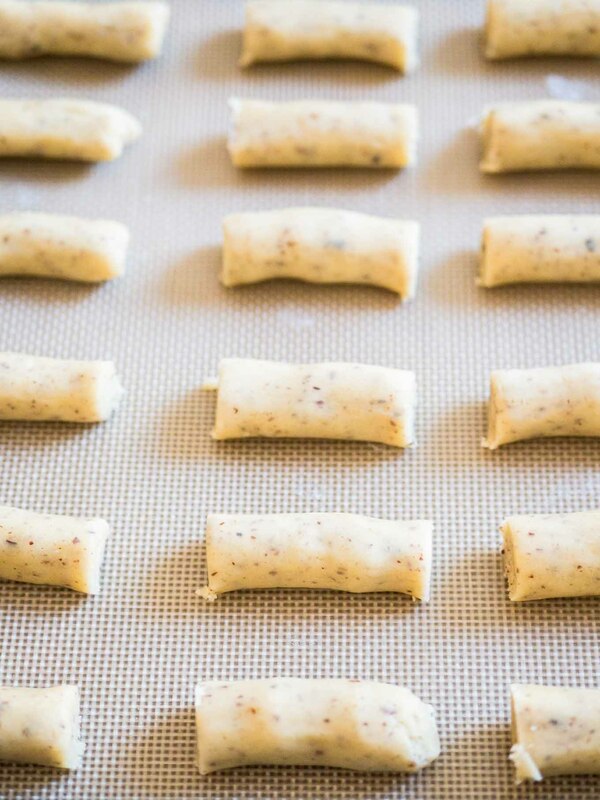 Wrap the dough in plastic foil and let it rest in the refrigerator overnight. Preheat the oven to 350°F (177°C) and line two large baking sheets with silicone mats or parchment paper. Remove dough from the refrigerator and divide it into eight pieces. On a lightly floured work surface roll each one into a 1/2-inch thick log. 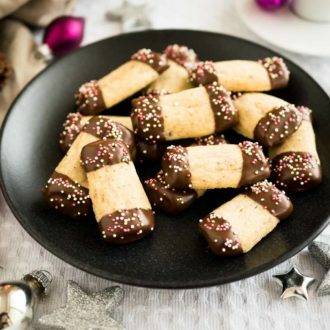 Slice each log into 2-inch long logs and place log cookies on baking sheets about 2 inches apart. Don't let the dough get too warm! Bake the cookies for 11-12 minutes or until lightly brown around the edges. Allow to cool for 5 minutes on the baking sheet, then transfer to cooling rack to cool completely. Melt the chopped dark chocolate in a double boiler or use the microwave. For the microwave, place the chocolate in a medium heat-proof bowl. Melt in 15-second increments, stirring after each increment until completely melted and smooth. 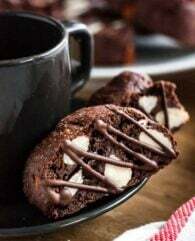 Dip each completely cooled cookie 1/4 into the chocolate from both sides and place onto a baking sheet lined with a silicone baking mat. Top with sprinkles. To help the chocolate set you can place the baking sheet into the refrigerator.